The 454th Ulsan Hash leaves from outside the Foreigners Compound Clubhouse at 10 am Sunday 31st July . 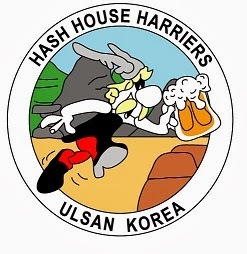 The 455th Ulsan Hash leaves from outside the Foreigners Compound Clubhouse at 10 am Sunday 14th August . The Hare for 31st July will be “F.A.F.” Sustenance shall be provided after hash. Hare required for the 14th August.